Designing spaces is, for Calvin Huang, a passion that extends beyond profit margins. With figures from Urbis’s 2018 March quarter report showing reduced local and foreign buyer activity and an increase in owner-occupier arrangements, a new generation of residential developers has emerged with a focus on designs that will hold both value and liveability. An avid art collector, Calvin’s development philosophy reflects his passion, combining the timeless elements of nature and fine art with high quality architectural, interior and landscape design. DCF’s growing Victorian development footprint is heavily influenced by Calvin’s design philosophy, which is evident in his four existing projects. The company’s first major project, INQU, is situated in the Victorian suburb of Kew and incorporates 36 spacious apartments and six retail outlets. INQU’s design was inspired by the interplay of opposites: creating a blurred line between indoor and outdoor entertaining spaces. From the contemporary clean lines to the soft finishes and calming colour palette, these spaces present a neutral canvas to which residents bring their distinctive style. Following the success of INQU, DCF developed Le Chloe, a residential project comprised of eight luxurious, three-story residences in West Melbourne. Featuring a faceted street façade, Bosch kitchens, private courtyards and lock-up garages, Le Chloe provides an oasis on the fringe of Melbourne’s CBD. 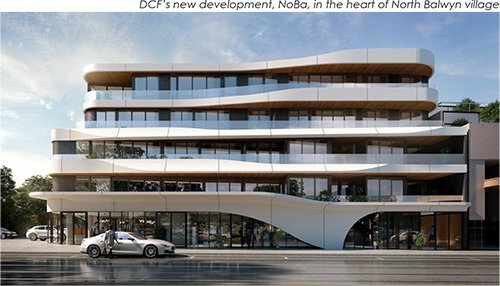 At its latest projects, the DCF team has focused on championing Australian artists as integral components of the design for two developments in North Balwyn. 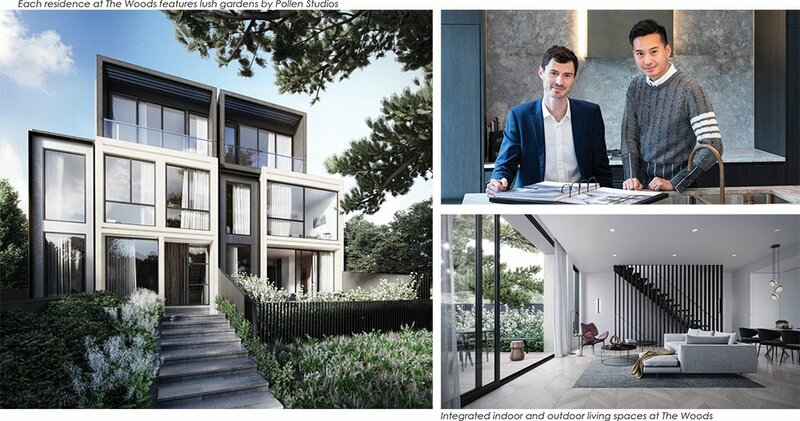 The first of these projects, in the heart of North Balwyn village, is NoBa. Named for its suburb, the four-level apartment complex is modern and sculptural in design, with bold contrasts and natural materials. In line with its philosophy of combining fine art with property design, DCF commissioned Stephen Ormandy, creative director at Dinosaur Designs Australia, to create a series of sculptures to reflect the form of the building. and quality design; hallmarks of DKO projects. Each balcony overlooks a lush, central garden, and there’s a rooftop terrace with barbeques, garden beds, a pergola and asymmetrically curved seating. Just a short drive from NoBa is DCF’s latest development under construction, The Woods: a collection of seven townhouses each named for a native timber. For The Woods, DCF has again commissioned DKO Architecture, along with Melbourne-based artist and sculptor, Amanda Dziedzic. Amanda created seven blown glass pieces, each with variations of tone and shade, to reflect each of the seven townhouses. Boutique landscaping studio, Pollen, is taking care of the gardens, selecting exotic and indigenous species inspired by the traditional gardens of North Balwyn. For Calvin and the team, the post-settlement experience is an integral part of any project. And one which is thoughtfully curated. To celebrate the impending settlement for residents of NoBa, DCF will host a settlement party at the Heide Museum of Modern Art. “DCF delivers an experience that is carefully considered, including the post-settlement experience,” Calvin enthuses. and Montreal-based artist, David Spriggs.